There were quite a few good reasons for me to write a solo concerto for bass trombone and wind orchestra. In the first place to commemorate my 35 years of friendship with bass trombone player Ben van Dijk, which coincides with my 30 year jubilee as a professional musician. (May 1, 2007) : my desire to contribute to the solo literature for bass trombone – there is a lack of lyrical compositions in which the vocal capacities of the instrument are fully utilized, and last but not least as an in memoriam for Ben’s father Piet van Dijk (1920-2003). He was a musician in heart and soul and a wonderful person. As a trombone and euphonium teacher he played an essential role in my later career as a musician, for which I am still grateful. An ambitious international trombone festival became the venue for the world premiere: Slide Factory 2007, organized in Rotterdam by the New Trombone Collective, ideal ambassadors for modern trombone literature. The actual creation of Canticles was an inspiring experience, working closely as I did with Ben van Dijk. I am grateful to him for his excellent suggestions, his passion and craftsmanship and I am sure this piece will find its way to the performing arena! 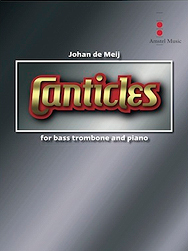 Canticles was commissioned by the Dutch Composers Fund “Fonds voor de Scheppende Toonkunst” at the request of the New Trombone Collective. The world première took place on May 6th, 2007 in the Laurens Church in Rotterdam during Slide Factory 2007, performed by Ben van Dijk and the Marine Band of the Royal Netherlands Navy conducted by Ivan Meylemans.